Yes! Your favorite uncooked tortilla is now available organic! Our premium uncooked tortillas are now made organic. We know that many of you are looking for organic alternatives, so our resident chef has developed the new Organic Tortilla Fresca. With over 50 years of experience, we have created the ideal recipe for organic uncooked tortillas. Still the homemade, fresh, restaurant quality tortillas you love. Our organic tortillas are perfect for every classic Mexican dish; burritos, fajitas, tacos, and quesadillas or even by themselves as a quick and tasty snack. Our fresh, homemade tortillas may also be used for healthy wraps, delicious fruit filled desserts or as a staple with any meal. Once opened, please store unused tortillas in the refrigerator. 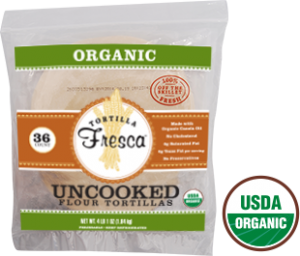 Organic Tortilla Fresca tortillas may be frozen as well, simply make sure they are completely thawed before preparing. Microwaves should never be used to prepare these tortillas. Prepare to experience the freshness of homemade tortillas in your own home! Our customers expect the best so we’ve taken extra steps and traditional methods to bring to your kitchen a high quality, premium uncooked flour tortilla. Our tortillas are made with 5 simple wholesome ingredients. 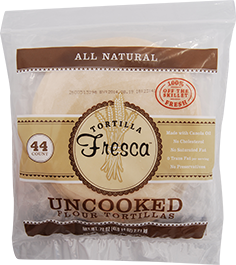 Our All Natural Tortilla Fresca™ uncooked flour tortilla allows you to experience the flavor, texture and freshness that can only be found in an authentic homemade tortilla. And Yes… you too can serve a homemade style tortilla without the hours in the kitchen. Heat and savor this fresh baked taste in less than 1 minute. Want to get creative? This is a very versatile product which can be used to make crepes, pot pies, cinnamon crisps, cookies, noodles, salad bowls, egg rolls, calzones and of course burritos and quesadillas … just to name a few.